1967: USS Liberty attacked by Israeli forces. 8 June 1967: The USS Liberty, a Navy/NGA SIGINT collection ship was attacked by Israeli air and sea forces. There were 34 Americans killed and 173 wounded. The ship was patrolling in International waters during the Six-Day War, and investigative reports indicate the Israeli forces were aware this was an American ship. Israeli forces claimed they had mistaken the ship for the El Quseir, an Egyptian horse carrier, but according to a 1981 NSA report on the incident, the El Quseir "was approximately one-quarter of the Liberty's tonnage, about one-half its length, and offered a radically different silhouette." Israel apologized and paid monetary compensation to the families of those killed and to those who were wounded. Israel also agreed to a $6 million dollar settlement for the ship's damages. The efforts of the Liberty's Captain and crew to keep her afloat, attend to the injured, and save lives was unsurpassed in naval history. 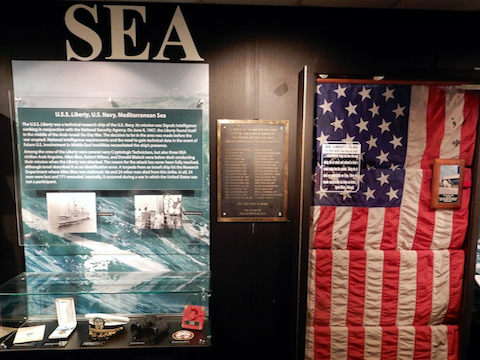 See photos from the museum's U.S.S. Liberty display, which is part of the Service and Sacrifice exhibit via the link at the end of the page. The NCMF acquired a rare USS Liberty shirt from a surviving USS Liberty crew member SSgt Bryce Lockwood. The shirt has been autographed by a variety of individuals spanning several military efforts. The historical lineage of this t-shirt from WWII to Vietnam and the Cold War makes it an unusual artifact indeed. Learn about it via the link at the end of the page. You may also want to check out A. Jay Cristol's book, "The Liberty Incident." The 2002 book, which focuses on the question “did the Israelis know they were attacking a U.S. ship", was written after 17 years of extensive research to include data acquired from NSA through FOIA requests. Mr. Cristol donated several copies of his book to the NCMF. Learn about his book via the link below. Learn more about the USS Liberty via a collection of historical documents on the NSA website. See link below.